Former New York Jets running back Bruce Harper tees off at the 27th annual Tim Teufel Celebrity Golf Tournament at Tamarack Country Club in Greenwich, Conn. Tuesday, Oct. 10, 2017. The golf outing, presented by Sweet'N Low, featured more than a dozen former and current sports celebrities competing on the course to raise money for the Fairfield County Sports Commission. GREENWICH — Inclement weather couldn’t stop Tim Teufel’s tradition. Rain forced the Tim Teufel Celebrity Golf Tournament to be postponed in August, but the rescheduled event took place on a fall day in summer-like weather. 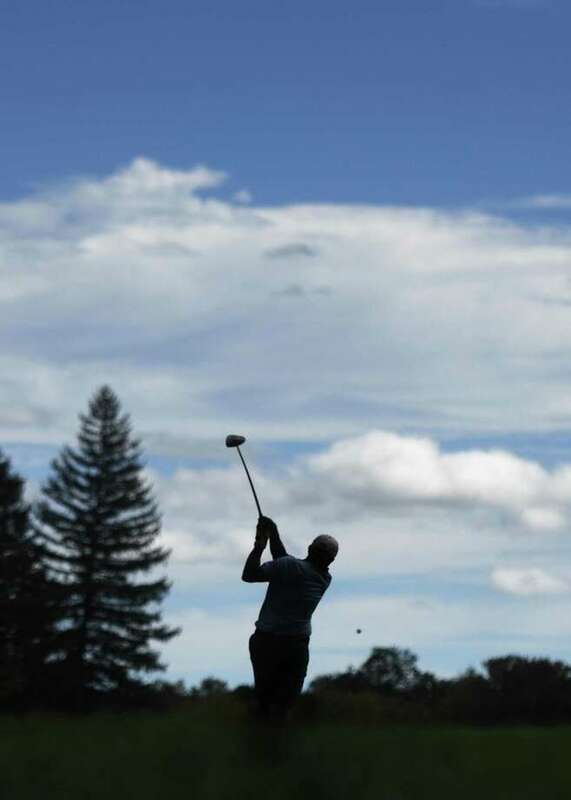 Tamarack Country Club was the venue where numerous sports celebrities focused on their short game and golfed for a good cause, as the Tim Teufel Celebrity Golf Tournament Sponsored by Sweet’N Low celebrated its 27th anniversary on Tuesday. The tournament, which featured groups of four, has raised money for the Fairfield County Sports Commission and its Chelsea Cohen Fitness Academy since 2012. From 2011-2016, Teufel served as third base coach of the Mets. Currently, he is roving infield instructor and ambassador for the organization. T hough the Mets made the World Series in 2015 and qualified for the postseason in 2016, this season saw the injury-plagued team struggle to a 70-92 finish. Indeed, Teufel is keeping his eye on the current playoff situation. Lee Mazzilli, a longtime Greenwich resident who played for the Yankees and Mets and managed the Baltimore Orioles, made another appearance at the tournament to support Teufel’s event. Joining Mazzilli was his son L.J. Mazzilli who is an infielder/outfielder in the Mets’ minor league system. Bruce Harper, who was a standout running back for the New York Jets from 1977-1984, makes a habit of testing his golf skills for charity. Harper likes what he sees from his former team, which was picked by many to have a losing season, but are off to a surprising 3-2 start. Charles Way, a bruising running back for the New York Giants from 1995-1999, also teed off at Tamarack. Way emphasized the importance of kids being involved in sports. As for the Giants and their 0-5 start to their season, Way is interested in seeing how they will respond. The Tim Teufel Charity Golf Tournament is one of many events Brookfield resident Mark Yusko coordinates. Yusko, who is still undergoing treatment and rehabilitation care following a surgery he had last year, was on hand once again Tuesday, to introduce the sports celebrities. Tuesday’s tournament commenced with Yusko driving his tee shot on the first hole. Former heavyweight boxer Gerry Cooney and former NBA guard Wes Matthews returned to Tamarack to show their support for the Fairfield County Sports Commission. Cooney, who went 28-3 during his professional career, co-hosts “Friday Night at the Fights” on SIRIUS XM RADIO every Monday and Friday from 6-8 p.m.
Matthews, a Bridgeport native, who played for the six NBA teams, including two Los Angeles Lakers championship squads, coaches the sport he loves at Greenwich Academy.